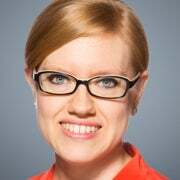 Sofia Gallo is a member of the Young Leaders Program at The Heritage Foundation. For much of American history, education was decentralized, seen as a responsibility of families, communities, churches, and local governments. Parents in the mid-17th century, for example, were not just seen as critical partners in their children’s education, but were expected to be their children’s primary teachers, creating a symbiotic relationship between parent and community values. Over time, however, primary education became more formalized and centralized. The Colonial Act of 1647 mandated that every town with more than 50 households would hire a teacher, and once a town had more than 100 families, a grammar school would have to be established. In this case, formalized schools served to ensure a shared mission, conserving and maintaining order in the budding community. Changes to the nature of work from agrarian to factory during the mid-19th century, combined with westward expansion, further encouraged a fragmented system of academies to give way to widespread public schooling. 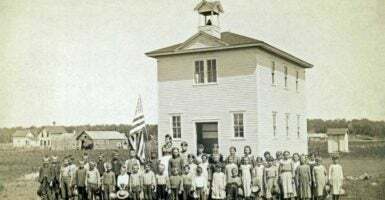 Formalized education grew increasingly sophisticated throughout the 19th century with the growth of the Common Schools movement—proto-public schools—designed to teach all children in the same “common” schoolhouse. The Common School Era eventually gave way to the Progressive Era, and what would be recognized today as a system of public schools. During the early 20th century, as education increasingly fell under a unified school board model, taxpayer financing increased but remained largely local. Until 1930, localities provided over three-quarters of K-12 education funding, with the remainder coming from the states. It wouldn’t be until the 1978-79 school year that state funding of education would exceed local funding. The federal government also began to spend more on K-12 education, with federal financing accounting for 9 percent of K-12 funding by that time. Today, state education financing accounts for nearly half of K-12 financing, local spending accounts for over 40 percent, and the federal portion now tops 10 percent of total K-12 spending. Yet as federal financing has grown, so too have efforts to dictate local school policy from Washington. Over the last few decades, there has been an effort to standardize education under the assumption that the same education system would work well for every state. Standardization of education reached a high watermark with Common Core in 2010, when 48 states (and the District of Columbia) adopted common standards, while 46 states (and the District of Columbia) opted to use Common Core assessments. But significant centralization over the past half century seems to be garnering opposition. Since June 2015, Missouri, Arkansas, Louisiana, and Tennessee have joined seven others states that scaled back their involvement with Common Core standards in previous years. While some states have not repealed the standards, some, like North Dakota and South Dakota, have begun reviewing their standards and assessments. Many more states have pulled out of the two national testing consortia. The Smarter Balanced testing consortium, which began with 32 states, is now down to 16 member states. The PARCC consortium, which began with 26 state members, is down to just six participants. Many state leaders say they are downgrading their involvement with the national standards and tests because they want students, teachers, and other local leaders to have more of a say in education policy to ensure that it is responding to their needs. “We will be producing a superior set of North Dakota standards for our public schools, written by North Dakota teachers, that establish clear and high expectations for North Dakota students,” North Dakota’s Superintendent of Public Instruction Kirsten Baesler said. “We are capable of developing our own Oklahoma academic standards that will be better than Common Core,” declared Oklahoma Gov. Mary Fallin when the Sooner State withdrew from the effort. In English Language Arts high school teachers and perhaps some middle school teachers may be emphasizing certain approaches to writing over others due to a concern for source-based writing in response to the Common Core State Standards. But if so, college instructors appear to value some key features of source-based writing (the ability to analyze source texts and summarize other authors’ ideas) much less than the ability to generate sound ideas—a skill applicable across much broader contexts. Parents throughout history have wanted schools to be reflections of what they value in an education for their children. As more states continue to leave Common Core, those that remain should consider the benefits of choosing their own path that works for students.